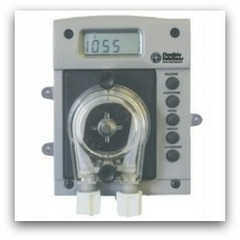 The HS115 Automatic Metering System is a 7-day programmable peristaltic pump that is specifically manufactured for the dosing of HeatsavrTM, the liquid solar pool cover. Whether you are currently using HeatsavrTM, or planning on trying it sometime in the future, this email will cover some of the most frequently asked questions. At this time of year, our phone rings consistently for this information, so I thought it prudent to share the technical details with you. Once installed and programmed, the HS115 will require very little regular maintenance. You will have to switch out the bottle of HeatsavrTM when it is empty, but that is about all. Annually, we do recommend replacing the Flex Squeeze Tube that is inside the roller assembly, as that part will wear down eventually, and annual maintenance keeps your system running at its best. If your system is subjected to severe weather, you may want to replace the tubing that runs from the pump to the bottles of HeatsavrTM and to the injection point, but this is up to your discretion. Finally, if you are hard on your bottles, you may occasionally have to change the Parts Assembly that attaches the bottles to the tubing, but again, that will depend on your unique situation. There are additional pump parts that are available if they need to be replaced, but the ones mentioned are the most frequently requested. If you would like to see these part numbers, they are listed on our Troubleshooting page (see following link).